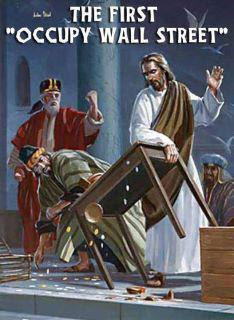 The issue is that Jesus was not a fan of exploitative commerce. In fact, he led the first occupation- he was the founder of Occupy Jerusalem. In the gospels, he enters the Temple of Jerusalem, where commerce has defiled the holy place. He takes those around him to task, and uses the popular support for his actions to defy authority. We can all learn from the example of Jesus. The idea of commerce and profit-making entering a place of worship is cringe-worthy- and indeed I have a visceral reaction when I read about megachurches with cafés and merchandise stores. But even if you’re mostly secular like me- there is something that you think should not be messed with; something that must remain pure and not tainted by money. It could be anything from politics to college sports; from education to healthcare. You probably know of some money changers you’d like to drive out. And that’s really what Occupy is all about. Driving away the money changers, and improving society rather than let profit dominate over people. A few days ago, I got a package in the mail. It contained a pamphlet, one that is not famous like Common Sense by Thomas Paine, but in the modern world is deeply relevant and useful. It is, simply, a road to revolution. 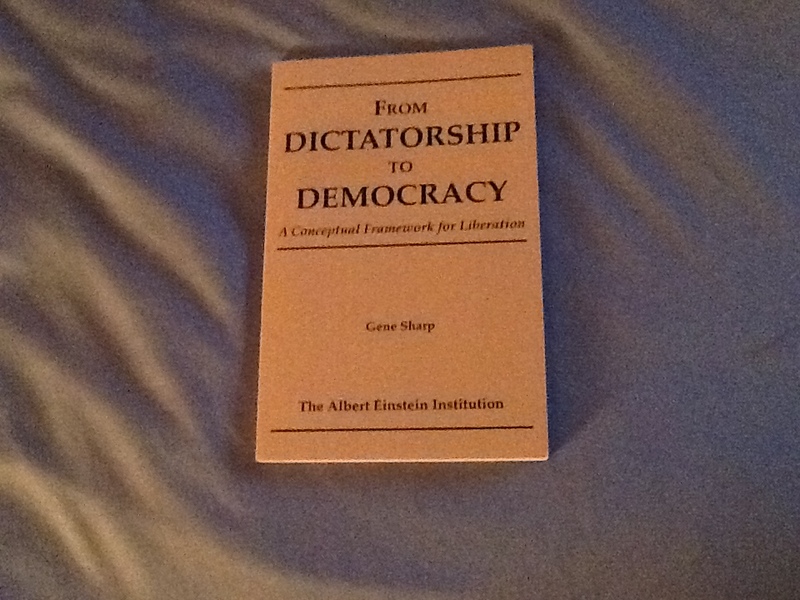 From Dictatorship to Democracy is the distilled wisdom of Gene Sharp, an 84-year old academic who lives in East Boston. His life has been quiet- he has written no best-selling books, held no prestigious professorships. However, he is the world’s leading expert on nonviolent struggle. He believes that ideas and willpower are more powerful than guns. Through case studies, one learns that even in the face of the worst evil, nonviolence had been used and been used effectively. Fear is what keeps people in line, supporting their autocrats. But if you remove your support, your obedience, then dictatorships crumble before your eyes. Nonviolent struggle is a way to empower people, and give them a way forward, past fear. Yesterday, the city of Buffalo moved $45 million of city funds out of megabank JPMorgan Chase and reinvested it in First Niagara, a community bank based in the city itself. The drive to put city funds in local banks and credit unions was led by Occupy Buffalo. Occupy San Jose in the fall of 2011 also raised the issue of muncipalities placing their funds in banks that aggressively foreclose on struggling families, and push credit cards with high interest rates on the desperate. In the Bay Area, the Most Holy Trinity Catholic Church in San Jose took $3 million out of Bank of America and Wells Fargo and put it in a small community bank. Our good friends at People Acting in Community Together (PACT) were instrumental in getting that to happen. Along with Alliance of Californians for Community Empowerment (ACCE), they are aggressive in preventing foreclosures through a variety of means. I participated in the writing group facilitated by Rev. Dan Harper, head of the religious education at UUCPA. It was nice to hear memoir content from people decades my elder, including one who served in World War II. In response to the prompt about a ‘road trip’, I wrote a short reflection called ‘Handa’ about my trip to my ancestral town in Highland Scotland. I’ll upload it when I’ve had time to type it out. It’s not presently very legible. Dan also had the idea of collecting the group’s work into some sort of booklet. I am definitely interested, though this was my first time participating in the group and I know much less about the concept. I said then, and I say now, that while there is a lower class, I am in it, and while there is a criminal element I am of it, and while there is a soul in prison, I am not free. Labor activist and Socialist Party politician Eugene V. Debs, on his sentencing for sedition, for speaking out against the United States’ involvement in World War I.